A picture of an alleged early prototype of a PS4 controller containing what appears to be a touchpad has leaked ahead of the PlayStation event. It had been rumoured in the previous week that the new PlayStation 4 controller would have a touchpad (or touchscreen?) on the front. 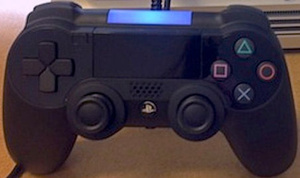 Now an image has been posted online by Destructoid that allegedly shows an early prototype of a PS4 controller with what appears to be a touchpad. The controller is wired to what appears to be a development kit. Destructoid cites multiple sources in confirming that it is indeed an early prototype of a PS4 controller. Sony is set to hold a PlayStation event in New York next Wednesday, February 20, where it is expected to unveul the next PlayStation console. Looks like it needs a change in diet. I think it'd be hard to use that area in the middle as a touch pad, the analog sticks would get in the way. It's a ripoff of the new OUYA controller... interesting. I do like the mic in the middle... that was a suggestion from the OUYA KS backers... I guess Sony was listening. Prediction: The touchpad/screen will make it so PS4 games can use the PS Vita as an alternative controller* ah-la the Wii U. It will go something like this, "... and if you have a PS Vita you'll be able to etcetera etcetera etcetera with the game." Cross platforming with Wii U games even. Not a bad marketing strategy... it ties in with what we've been told about the new PS4's "play options" selling point. *Yes I know it's already done... to a lesser extent. Great! Controllers are already ridiculously expensive. What's one of these going to run you, with a screen on it, $149.99? Can't wait! That said, after all this time, you'd think Sony would redesign their controllers. The two thumbsticks at the exact same height, right next to each other are so uncomfortable to use, especially after hours of play. If they did do this, it explains why no rumble pack in it; it'd screw with the screen. But like always with a peripheral like this, it'll come down to the developers to showcase what it can really do, and then will it have continued support. All eyes on you Sony, what's your next move? No mention of the PS Move like blue glowing rectangle on the back. integrated move? Good point, I was wondering about that myself.